Marketing efforts must be very focused and information-rich when marketing a medical device. Branding strategies, trade show displays, training and tracking programs, and eLearning elements are all part of an effective, integrated marketing and growth strategy. Count on DDA Medical to do it all. From full-scale video production in our in-house studio, to vibrant trade show graphics, interactive online experiences and eLearning portals, DDA Medical has all the tools under one roof. Medical device marketing can be a daunting task, especially when you consider the many aspects that can be involved in a successful direct medical marketing campaign. Information must be well-focused, engaging, and help create a strong brand identity, whether it’s for a new product launch, device rebranding, or general medical product marketing. This requires not only a medical device marketing firm offering a wide variety of services, but also one that handles everything in-house, guaranteeing a cohesive and refined campaign that affirms the identity of your brand. DDA Medical – a premier medical marketing agency and division of Dynamic Digital Advertising – provides nearly every medical device and equipment marketing service under the sun, simplifying your marketing strategy and creating a cohesive look and feel that helps establish brand identity. Whether it’s the design and development of a medical website to accompany the launch of a new device, logo design and branding services for an exciting new medical product, or a full-scale marketing campaign that includes all of these elements, DDA Medical is the perfect solution for your needs. As a pioneering medical marketing company, DDA Medical is uniquely positioned in the world of medical device, instrument, and equipment marketing. Because our in-house team of experts includes custom programmers, graphic designers, medical copywriters, animators, and other specialists, all of your medical device marketing needs can be taken care of under one roof. This is not only convenient and efficient, but it provides the continuity that is impossible with different medical marketing agencies handling different services. 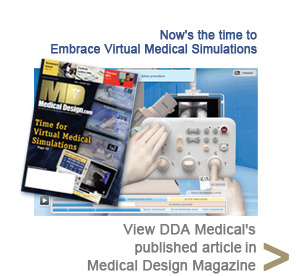 With DDA Medical, your medical device and equipment marketing campaign will be well-planned, organized, and cohesive. From direct marketing to physicians, physician practice marketing, and pharmaceutical marketing, to direct to consumer marketing and interactive direct marketing, DDA Medical is your one-stop source. At DDA Medical, our versatility enables us to stand alone in the medical marketing world. From interactive medical marketing and trade show displays to search engine marketing (SEM) services and other types of online and Internet medical marketing, DDA Medical is different than other medical marketing companies. Whether you’re marketing to physicians, or dealing directly with patients and consumers, DDA Medical will work with you to create a customized and effective marketing strategy that is solely yours. Contact DDA Medical today and let us put our medical device and sales marketing services to work for you. Copyright © 2016 DDA Medical. All rights reserved.